By placing an order with us, you are offering to purchase a product, and representing that all information you provide to us in connection with such order is true and accurate and you are an authorized user of the payment method provided. All prices displayed on our Website are quoted in Singapore dollars (SGD). All prices displayed on our Website are subject to change and we reserve the right to make changes to all prices without prior notice and without incurring any obligations to you. In the event whereby a merchandise displays an incorrect price, either due to typographical or other errors, we shall reserve the right to decline or cancel any such order placed for the incorrect price, regardless of whether the order is being or has been processed. Upon cancellation of your order due to the pricing error and if payment has already been made or if your account has already been charged for the purchase, we shall credit your account in the amount of the incorrect price. As an e-commerce business, we aim to provide the most accurate images, information and descriptions visually to ensure a smooth and satisfactory transaction. However, as elaborated below, discrepancies may happen. All colours of our products displayed on our Website may be perceived differently by different parties due to varying conditions and devices. The presence of discrepancies in the colours due to the reason mentioned above shall not be considered as a defect and we shall not be liable. All measurements of our products displayed on our Website will be measured as accurately as possible. Measurements of products are taken when product is laid flat and is taken across the item. The presence of slight discrepancies is inevitable due to the nature of the mass manufacturing process. A difference of 0.5”-0.8” between the product(s) received from what was provided in our given measurements shall not be considered as a defect. However, if a discrepancy above the earlier mentioned range is found, an exchange will be then be processed. For more information, please refer to our Exchange/ Return Policy below. The Policy is based on the Singapore Personal Data Protection Act 2012 (“PDPA”) and all the associated regulations and guidelines as may from time to time be issued by the Personal Data Protection Commission (“PDP”) of Singapore. Jenesyss takes protecting your Personal Data very seriously and comply strictly with the provisions of data protection laws. Under no circumstances is the collected data sold or passed on to unrelated entities or any third party merchants for any other reason unless required by law. All email addresses in our mailing list are kept strictly confidential. This does not include trusted third party agencies who assist us in the operations of our Business and Website. iv. Processing of any payment instructions, direct debit facilities and/or credit facilities requested by you. We only accept payments via PayPal. Any request for cancellation of order will be declined after payment has been made. Orders will automatically be cancelled if payment is not received. Please note that we do not accept ATM transfers or payments via Internet Banking. 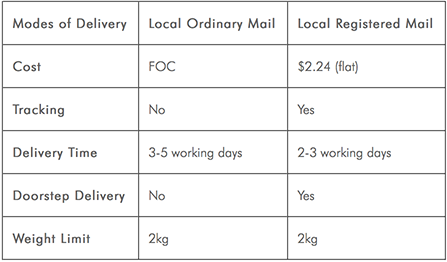 For registered mail orders, a Registered Article (RA) Number will be allocated to you via email when the package is sent out. You can track your package via the RA number at: http://www.singpost.com/personal-needs.html. We have recently introduced worldwide shipping. For worldwide shipping rates, you may add the items to cart and the system will provide an accurate rate for the shipping of the items to your country. Orders will be processed and dispatched within 1 to 2 working days upon verification of payment. Only upon dispatchment, you may expect your purchases within the estimated Delivery Time as stated in the table above. Delivery will be carried out during working hours from Monday to Friday, excluding weekends and local Public Holidays and you will be informed via email once your parcel has been dispatched. All delivery will be handled via mail. Any request for meet-ups or self-collection will be duly declined. We accept exchanges for items bought in the incorrect size only if the item in the size you wish to exchange to is still in stock. In the event that the item in the correct size is out of stock, we will issue an exclusive code* back to your account upon receiving the returned item. For all exchanges/ returns due to the purchase of incorrect size, all postage charges shall be borne by you. For exchanges due to defective item received or wrong order sent, we will provide a full refund in the event that we have ran out of stock for exchanges. All postage charges for the returns in this case will be reimbursed by Jenesyss. All exchanges have to reach us within 10 working days from the day the parcel was delivered and will only be handled via mail. Exchanges/ refunds will only be done if item is returned to us in its original condition (unwashed, unworn and unaltered) and with the tag intact. Jenesyss will not be liable should you purchase our apparels from third parties. All requests for exchanges in such cases will be duly declined. Please email us at hello@jenesyss.com for all requests on exchanges/ returns. *Exclusive codes are valid for a period of 3 months from the day of issuance and are strictly non-refundable, non-transferrable or extendable. Exclusive codes issued can only be utilized in one transaction and any excess amount will not be refunded. You are advised to hand wash all Jenesyss apparels (individually) without soaking as colour transfer may occur. We would encourage you to steam/ iron all Jenesyss apparels on the reverse side using low to medium heat and indirect heat (by placing a fabric/ cloth in between the item and iron). Jenesyss has the discretion to update the Terms & Conditions at any time. The date will be revised at the bottom of this page. We encourage you to frequently check this page for any changes to stay informed. Any queries if not answered on our Frequently Answered Questions (“FAQs”), can be directed to hello@jenesyss.com and we will work to get back to you the soonest possible. Acceptance of Terms: By using this Website, you signify the acceptance of the Terms & Conditions. If you do not agree to any of them, please refrain from using our Website. Your continued usage of the Website will deem your acceptance.